Open their heart to the rich glory of natures most eye-catching hues. This unique and sophisticated bouquet offers a gift of beauty like none other. 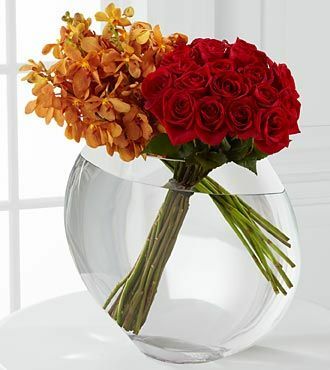 Brilliant golden Mokara Orchids are the perfect pairing to our bright red 24-inch premium long-stemmed roses brought together in a superior 13-inch clear glass pillow vase to create a gorgeous display of warmth and boundless cheer. Includes: 18 stems of 24-inch premium long-stemmed roses, 12 stems of golden Mokara orchids and a superior 13- inch clear glass pillow vase. Approximately 22H x 23W.